For only two years of operating, BIG BERRY brand has received various honorable recognitions. The innovative lifestyle concept was spread in different countries and among different publications around the world. See below some of the top achievements of BIG BERRY. Cloudnesting - a new tourism category answers to the changing lifestyle and travelling concept. A powerful way to meet the new way of travel & living, harmouniously combining nature and luxury. More than 40 innovative entrepreneurs took part in the competition this year, among them the commission selected 10 finalists who bid for the Best Business Idea 2016/2017 Prize. BIG BERRY was chosen as a successful example of a sustainable tourism model by a Slovenian tourist agency who will create the tourism development strategy of Bela Krajina. Hosekra - name for innovation, quality of life and sustainability. Hosekra is the backbone of the Slovenian house project - wooden construction of the pavilion at the WOG 2018 in Pyeongchang, South Korea. Mother company Hosekra received highest possible rating assigned by credit rating agency. In other words, Hosekra has extremely strong capacity to meet its financial commitments. BIG BERRY and Hosekra were a big part of the Radio1 show, which came to be the most listened radio show in the history of Slovenia. 5 days, 2 speakers and showmen, 34m2 house lifted in the air! 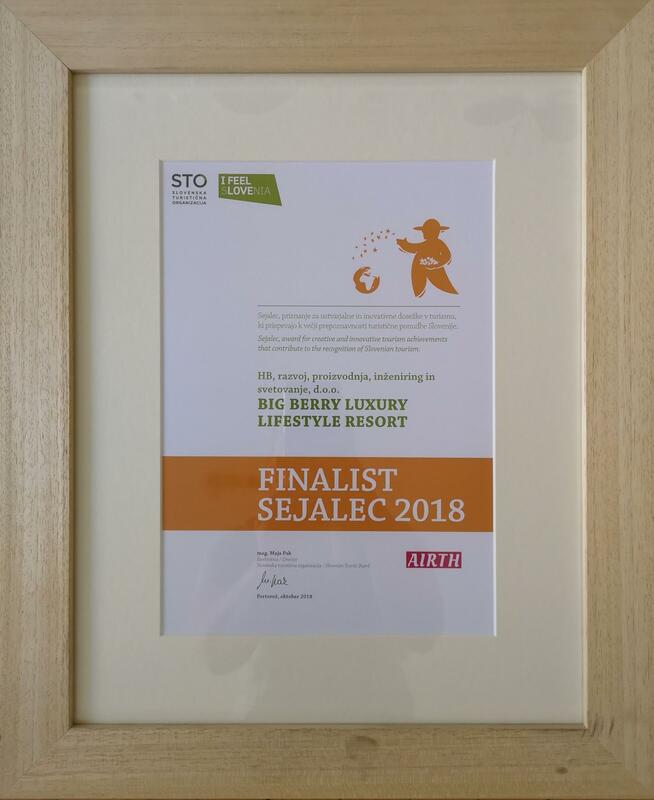 Sejalec, award for creative and innovative tourism achievements in Slovenia.